There are a couple of niceties in OneNote for iOS that are new to me, as an Evernote user. I like how I can insert hyperlinks with the tap of a button to keep my notes looking clean, and I love being able to change the fonts in a note. 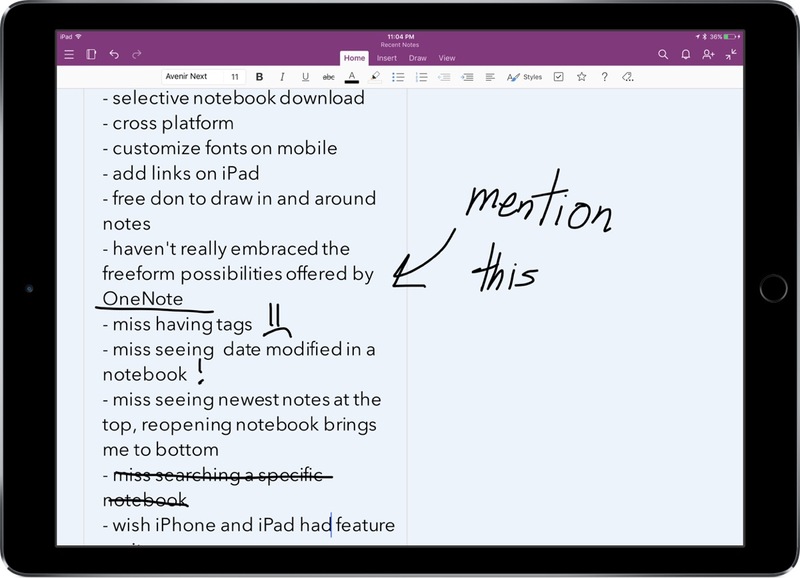 the free-form nature of OneNote is very interesting to me because of how well it mimics a real notebook experience. I can type text out, format it how I like, and then actually draw all over it. Evernote keeps drawings, images, and files as separate entities. OneNote lets them live as layers that co-habit the same X and Y axis, so I can actually highlight words with a highlighter. That’s really fluid and wonderfully simple, but it is taking me more time than expected to get used to. It’s not something that I’ve been dying to do, but it’s a very empowering and appealing aspect of OneNote that I want to explore further. The number one thing that’s still slowing me down — and which I’ve voted for on the OneNote forums — is the inability to sort notebooks or sections by Creation Date or Modified Date. The default behaviour is to sort all notes by Creation Date in descending order. I can start to manually move these notes, but that isn’t a very useful solution for me when notebook sections contain hundreds of notes. What’s more: each time I load OneNote up, I’m brought back to the very top of my section list. So if I want to see the latest note I created in that section, I have to scroll all the way down. That gets tired, fast. There is a “Recent Notes” section in OneNote that’s a special amalgamated view of all notebooks and sections, sorted by date modified in ascending order. This means the newest notes just float to the top, and you can pin extra important ones so that they stay there. I like that view, but I don’t like how it includes every single note from every single notebook. I want a more localized view of what I’ve changed in a particular notebook, since I purposely separated my work and personal life into different notebooks within OneNote. I don’t want my recent work notes gumming up the works when I’m at home, or vice versa — so the Recent Notes view isn’t actually of much use to me right now. This feature request should be very possible because all of the necessary data is already being tracked in OneNote, so I’m really hoping to see it arrive in one of the next few updates. In case you’re a OneNote user (or recent convert) who also feels strongly about it, please vote for more powerful OneNote sorting here.